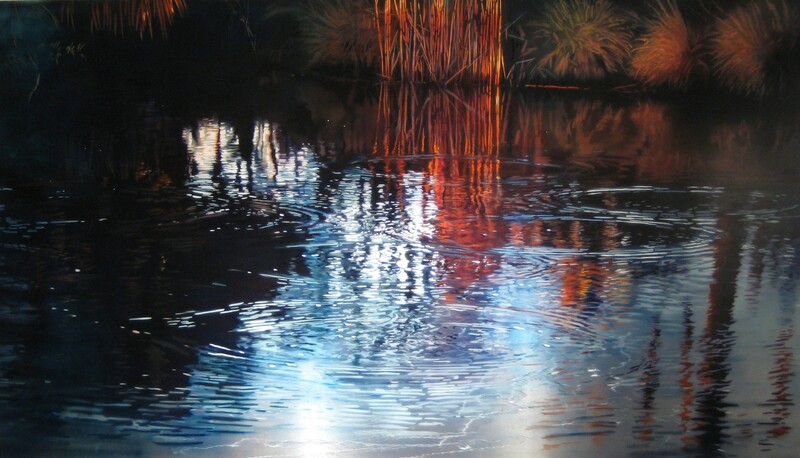 David Kessler paints water, its reflective surfaces and the foliage that usually surrounds ponds or rivers. He paints acrylic on aluminium, scrapping away parts of the way to expose the reflective surface of the metal underneath. Through a combination of these methods, Kessler creates abstract works that highlight the beauty of nature, water and light. This combination of hybrid elements forces the viewer to shift their perception to accommodate the incongruity of light being reflected from the metal surface, while at the same time being absorbed by the painted areas. This reinforces the strange visual perplexity of the paintings that are at the same time realistic and holographic. "The dual concerns of working with simulation: refracted light simulating paint, and hybridization: the use of aluminium, wire brushes and paint; are an attempt to create an image working within some kind of context that is post-modern - and I use that term simply to mean after modern rather than against modern." 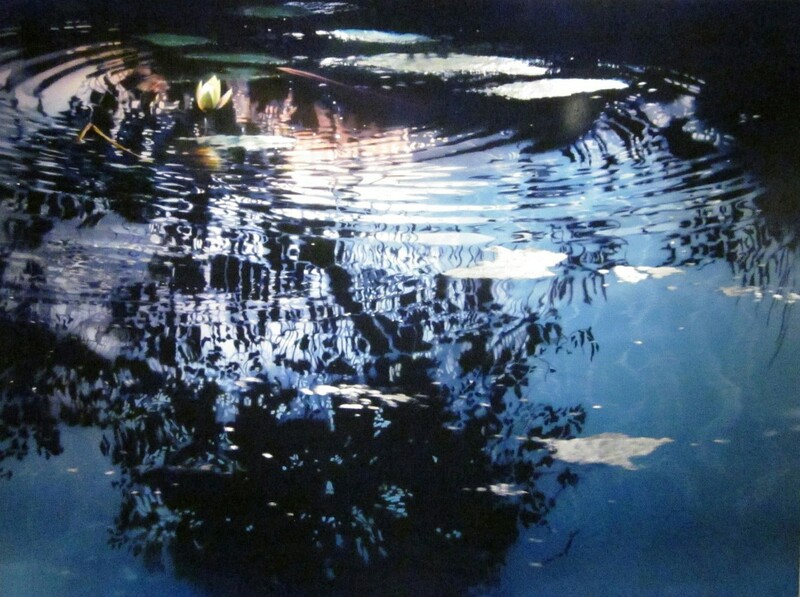 Kessler chooses water as his subject matter because as he says it is ‘universal and allows me to paint images close up’, this means he can explore the properties of the water and the patterns in the image. He works from slides, because they are transparent he can layer up images in order to create the 3D composition he desires. He then applies the paint in light layers and uses wire jeweller’s brushes to create texture. Because of this way of working Kessler’s works tend to be at least 1-meter wide loose. 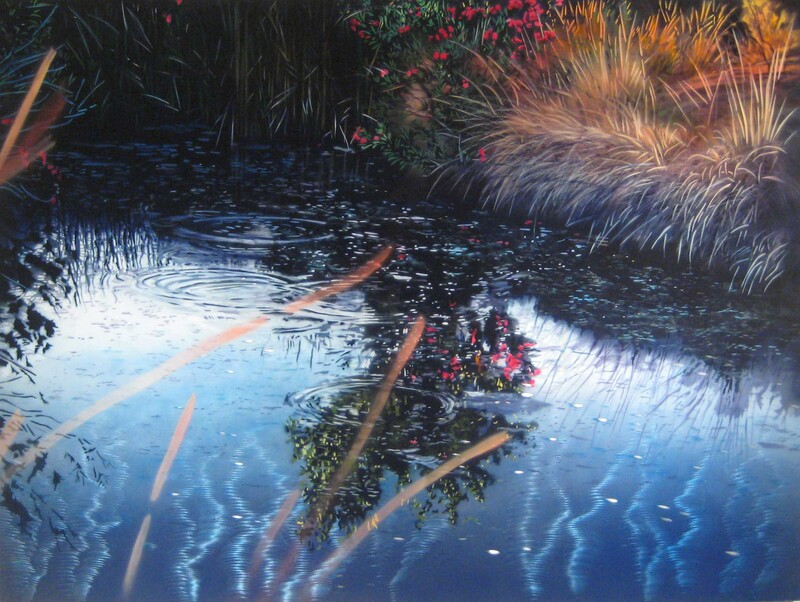 He uses resin on his work if the subject matter is that of the water alone and does not include any above water plants, he explains ‘I feel the resin almost mimics the actual surface of the water as it is highly reflective. It also enhances the slightly holographic quality of the metal work as well as intensifies the colours’. From left: ‘Shadow Line’ Acrylic on aluminium, 91.5 x 122 cm.